Happy Clients Archives | Wiggle Room | Organization for Busy Moms!Wiggle Room | Organization for Busy Moms! 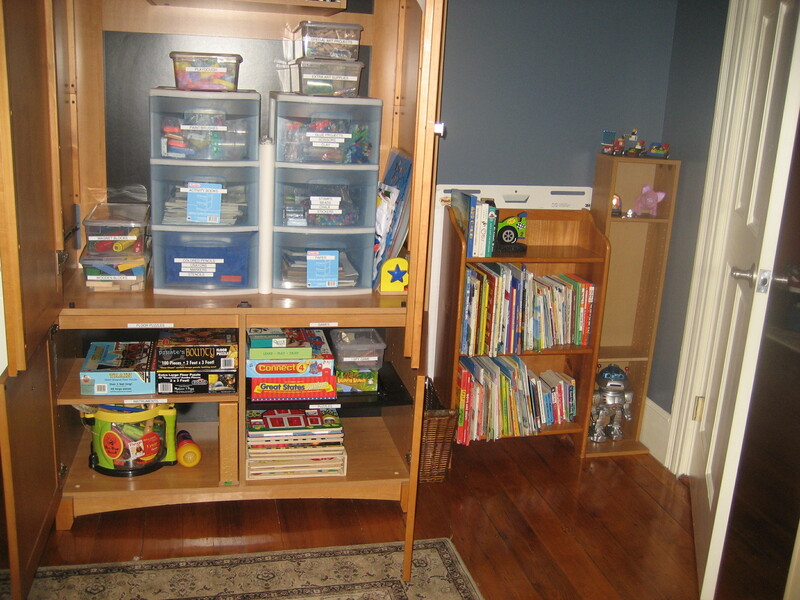 Wiggle Room | Organization for Busy Moms! A Wiggle Room gift certificate can be a creative and thoughtful way to help bring order to the lives of busy moms and dads, overworked professionals, friends or relatives that are moving (or have recently), or might be expecting a new child- really, just about anyone! Wiggle Room’s goal is to create systems that simplify clients’ lives. Home organization is such a personal service, we must take time to establish a relationship with each of our clients, starting with our free 30-minute face-to-face assessment. We do an in-home assessment, and create a plan for working together. Each client and space is different; the size of the space, the current state of “things”, and the client’s goals are all factors in determining how much time a project will take. We aim to use what you have around the house so you’re not spending lots of money on supplies too. While our services are available hourly, we also offer two (money saving!) packages. These offer some guidance in figuring out what size gift is appropriate for the lucky recipient. To read more, check out the “Organization Packages” on our website. And don’t just take our word for it- listen to those whose lives have been impacted through some professional organizational help! If the gift of Wiggle Room sounds like just the right thing for someone on your list this year, do not hesitate to contact Wiggle Room! We’d love to take the time to speak with you and tailor a gift package that suits your recipient’s needs perfectly! 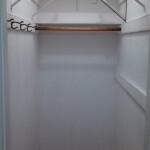 This week’s featured makeover shows off a project we see all too often- the extra closet… with oh so much potential, but currently the bane of our organizational existence! As always, the first order of business was to “get sorted”. The challenge in this case was how much stuff crammed atop the closet’s high wire shelves. Coupled with the floor being crowded with an assortment of items that made stepping into the closet nearly impossible, you can imagine our trepidation as we gently starting pulling things out. It looked as though if we moved one thing wrong, we may cause an avalanche down on top of us! Not to be deterred, we got each and every thing off those shelves & off that floor, and found an ideal closet space awaiting us! 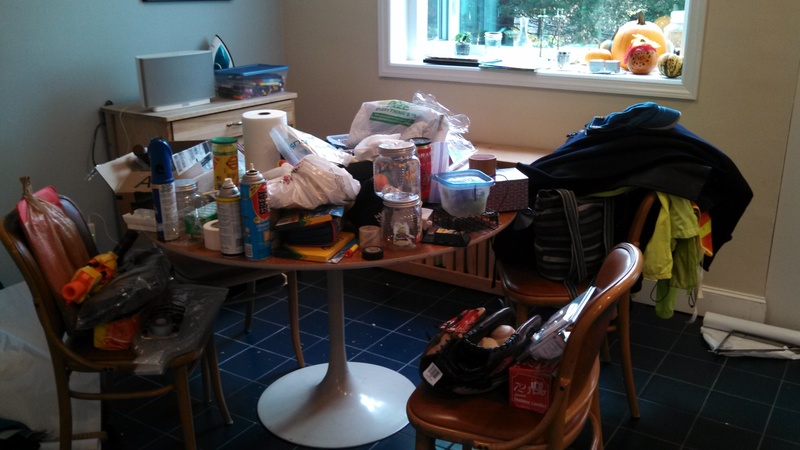 With the closet emptied, we arranged all it’s contents on the kitchen table. Next step, I started grouping items (“like with like”). 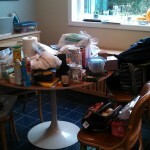 As I did this, our client started spotting items she didn’t need to live in the closet. 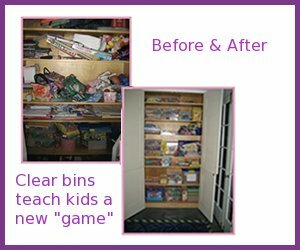 With all the contents sorted, it was easy to find new, more suitable homes, for a lot of what had accumulated in the closet. Spare electrical parts and infrequently used household sprays moved to the garage, though collected in a bins rather than loose. Expired art supplies, like dried out paints were trashed while the good supplies moved into the kids’ art cabinet (a project we had tackled in September). Out-of-season sports equipment, along with other infrequently used stuff headed off to the basement. After we purged or relocated the bulk of the closet’s contents, the pile of things to return to the closet was actually quite small. All in all, we needed just 5 different clear bins to get the closet back in shape. We took a step back to assess, and it was shocking how much room was still leftover, and better yet, how much light now filled the space! With all the extra space we set out to uncover items lurking down in the basement or otherwise out of the way that could use a closer home due to frequent use. We made room for a stash of paper towels, Kleenex, and toilet paper up from the basement storage so that fewer trips downstairs were necessary. 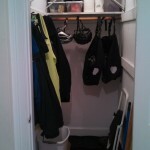 One remaining order of business- purchase and install clips (similar to this 5-Position Wall Organizer) to hold the mops and brooms flush against the empty right wall for easy access. 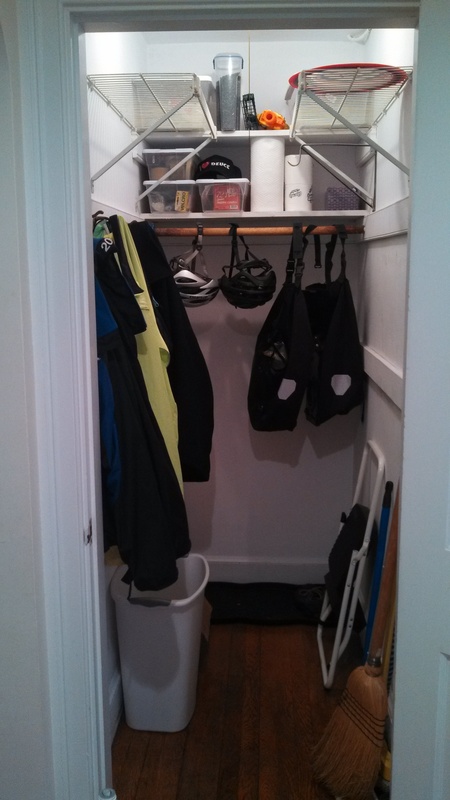 With two people, the closet overhaul took less than 2 hours! While we wrapped up, our relieved client admitted what we hear all too often- it was the kind of project she never would’ve found time to have tackle solo. 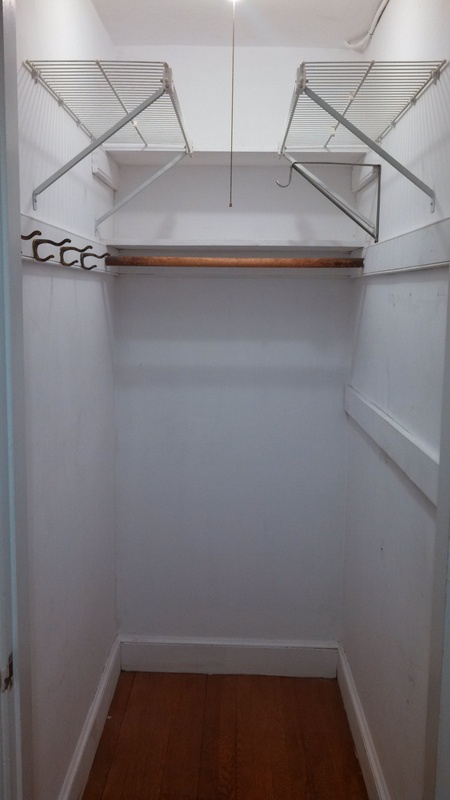 If you’re looking for a little help getting a hall closet under control, you know how to find us! And who knows, you just may be our next featured makeover! It’s quite simple, probably even obvious to some, but after peering into many closets, drawers, cabinets, and desks, we can assure you that it’s not always so. In a recent bathroom organization project (which technically was little more than surveying the contents of the drawers, sorting it, and moving it around) I discovered that the client had 12 unopened tubes of toothpaste, 6 new cans of shaving cream, and no fewer than 35 bars of soap, scattered across 6 drawers and 4 cupboards. Stashing commonly used products is practical, but we want to make sure it’s judicious— not because too much clutter is hiding what you already own. 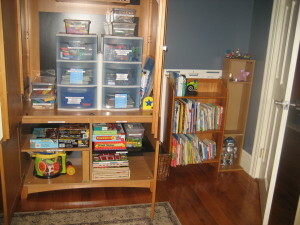 After the reorganization, top drawers held items used every day, while the bottom drawers housed the (plentiful) spares. Each type of product was stored together, so when the client opens any drawer it’s immediately obvious what they have and what they might need. If you’ve been meaning to organize a portion of your home, whether large or small, but haven’t been able to figure out how to go about it, give our “like with like” mantra a whirl. Pull everything out, sort it, and then put it back “like with like”. Be sure to keep commonly used items easy to access! Once like items are stored together— whether Tonka toys, towels, or toothpaste, you’ll be on your way to easier and more streamlined storage solutions.